Years later I was introduced to the section of the Penobscot below its confluence with the Passadumkeag River. I was fortunate to begin learning this section while fishing with Edie Rief as my guide. Sadly, it’s been ten years since Eddie passed away, but not without instilling a love for this section of the river in me. The allure of “Eddy’s Section” results from its many islands, ledges, gravel bars and interesting, if not easy rapids. This section begins with quick water flowing through numerous rock ledges, followed by a short rapid. At the tail of the rapid you find yourself in a broad section of relatively shallow and surprisingly productive riffles. During summer flows I’ll often hop out of the boat here so I can cool off and guide the boat with the painter in hand. Wading through this section allows me to position my clients to most effectively fish the gravel drop-offs that typically hold feeding smallies. With a slight westerly breeze we may soon find ourselves favoring the western shore often fishing the slot between the mainland and Tomar Island. 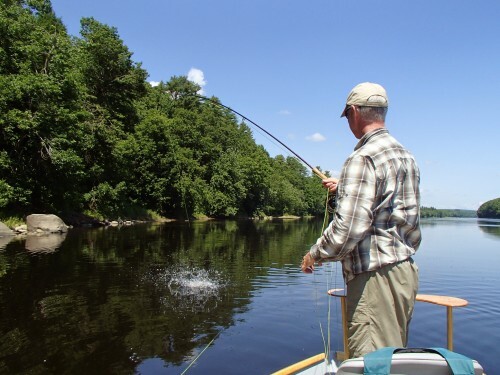 When river flows dictate, we remain in the boat, while low summer flows provide anglers an opportunity to wade along Tomar Island or one of its smaller neighboring unnamed grassy islands. With the mid-morning sun and agreeable smallies, we often remain within sight of Tomar Island for hours. Eventually the lower river beckons and we somewhat reluctantly continue our journey downriver.